Well it is hard to believe that it is almost 2 years since my last post. I have a very special friend who has recently started writing a blog herself - it is beautifully written and you feel the need to keep checking for the next instalment. Anyway we were chatting and she challenged me to start on mine again - we had a laugh about it - what would I write after all this time. She promised to hound me until I wrote something so here I am haha!! On rereading my last post - to me I felt there was a sense of sadness and tiredness in it. Truthfully the days since my last post have been filled with a medley of ups and downs. 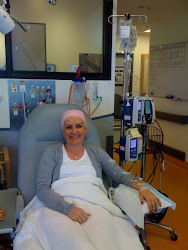 I found the time after my chemotherapy and radiotherapy ended to be one of the most challenging. I had been told that this could be a difficult time but I was certainly not prepared for the many dark days that were to follow. I soldiered through for quite some time until at last I realised that the daily medication I was taking may have been contributing to my low mood , aching bones and struggling brain. To cut a long story short I have come off that tablet and changed to another. I cannot express to you how different I felt - I have gone from strength to strength. We have had many changes over this time . My hair is long and curly haha - a far cry now from the perm and set look I was sporting for quite a while after it started to grow back after chemotherapy. Both the girls are at a new school. A very caring and nuturing place and I have had the joy of connecting in with some wonderful new friends there, as have they. We are at a new church filled with welcoming, vibrant and supportive people - such an encouragement to me. The overseas holiday that we had to cancel due to my diagnosis was rebooked and thoroughly enjoyed by all four of us. I became involved with a very special cancer charity that is run by the most amazing group of people and through that connection I have had the opportunity to go on a retreat, join a writers workshop, hear a multitude of speakers share their knowledge about many topics and attend art workshops. We have finally started renovating our home earlier last year and although not yet quite complete - it is great to see things moving forward after a very long time. Overall this last year I have felt a shift from just surviving to being on the road towards thriving!!!! I am so thankful for my relationship with God which has sustained me through the ups and downs , to know He is there no matter what and that He never leaves me. Recently I read a quote that said "The art of life is to surrender your brush and canvas to the Master artist." This has stuck with me . How beautiful is the life that is filled with the Fathers love, His plans, His purpose and his prescence. How wonderful is it to see the Masters brushstrokes unfold across each of our lives as we draw closer to Him. To see colour added , hope renewed, broken hearts restored and dreams awakened. How amazing will it be one day to see the unveiling of his completed work in each of us as we surrender to an all powerful and loving God. Oh how he loves us !!!! I am not sure of the whys of this road with its twists and turns but I am sure of The One who holds us in His hands through it all. I am sure that even if we want to give up on God at times He will never give up on us!!!! !